Overlooking Lake Maggiore and surrounded by nature, the apartment is located in a small residence above Tronzano Lago Maggiore, 100 m. from the lake in a very quiet, just 2 Km. from the Swiss-Italian border. The large terrace and large panoramic windows allow you to enjoy the fantastic view of the lake, the Brissago islands and the surrounding mountains. Many sites of interest within a short time: Islands (Borromean Islands on Lake Maggiore) markets (Luino, Cannobbio), ancient villages (Indemini and be spiraling Valley), other cities: Luino (15 min. ), Bellinzona (25 min.) , Lugano (30 min. ), Locarno - Ascona (25 min.). The apartment of 65 square meters. consists of a large living room with a well equipped kitchen, a double bedroom, a bathroom with tub / shower, a dressing room equipped with laundry, a roof terrace of 20 sqm. Private covered parking. Communal gardens. Accommodates up to families of 5 people. Equipment: living room with a sofa bed, satellite TV (Astra + Eutelsat), stereo, DVD player, pellet stove. The kitchen is in the living area and is complete with dishes and all necessary appliances (eg. Refrigerator, freezer, dishwasher, induction cooker, electric fan oven, microwave, coffee maker, kettle ...) . Double bed, clock radio, 5th single bed. Heating with pellet stove, air conditioning, internet Wifi. Hair dryer, vacuum cleaner, washing machine and detergent, drying room, iron and ironing board. Guide local activities, local maps, books and games for adults and children, video library. During the winter the apartment is heated by a modern pellet stove that needs a minimum of daily cleaning but gives a warm and relaxing atmosphere with the living flame visible in the middle of the living room where you can relax sipping a tea and reading a book . OUTSIDE AREA: 20 square meters of covered terrace (equipped with garden furniture), private covered parking space (next to the entrance gate), a large covered space that can 'be used as storage for sports equipment, common garden. The prices include the final cleaning, electricity, gas, water and WiFi. Not included are the costs of air conditioning and linen. Required deposit of € 150.00, for any damage. Pets not accepted for reasons of allergies. Overlooking Lake Maggiore and surrounded by nature, the apartment is located in a small apartment above Tronzano Lago Maggiore, 100 m. from the lake in a very quiet, just 2 km from the Swiss-Italian border. The large terrace and large panoramic windows allow you to enjoy the fantastic views of the lake, the Brissago islands and the surrounding mountains. Many places of interest within at short time: Islands (Borromean Islands on Lake Maggiore) markets (Luino Cannobbio) and the villages (Indemini and be spiraling Valley), other cities: Luino (15 min. ), Bellinzona (25 min. ), Lugano (30 min. ), Locarno - Ascona (25 min.). The apartment of 65 sqm Consists of a large living room with a well equipped kitchen, a double bedroom, a bathroom with tub / shower, a dressing room equipped with laundry facilities, a panoramic terrace of 20 sqm. Private covered car parking. Garden. Accommodates up to 5 people. EQUIPMENT: living room with a double sofa bed, satellite TV (Astra and Eutelsat), stereo, DVD player, stove pellets. The kitchen is located in the living room and is fully equipped with crockery and all Necessary appliances (eg: refrigerator, freezer, dishwasher, induction cooker, electric fan oven, microwave, coffee maker, kettle ...). Double bed (with twin mattresses), radio-alarm clock, 5th single bed. Heating with pellet stove, air conditioning, internet Wifi. Hair dryer, vacuum cleaner, washing machine and detergent, drying room, iron and ironing board. Local activities guides, local maps, books and games for adults and children, video library. A warm and relaxing atmosphere in the middle of the living room where you can relax and sip a tea and read a book. Outodoor AREA: 20 sqm terrace (equipped with garden furniture), private covered parking space (next to the entrance gate), a large indoor space That can be used as storage for sports equipment, garden. The prices include the cost of cleaning, electricity, gas, water and WiFi. No pets Because of allergies. Mit Blick auf den Lago Maggiore und umgeben von Natur, die Wohnung ist in einer kleinen Residenz vor Tronzano Lago Maggiore, 100 m entfernt. vom See entfernt in einer sehr ruhigen, nur 2 Km. von der Schweizerisch-italienischen Grenze. 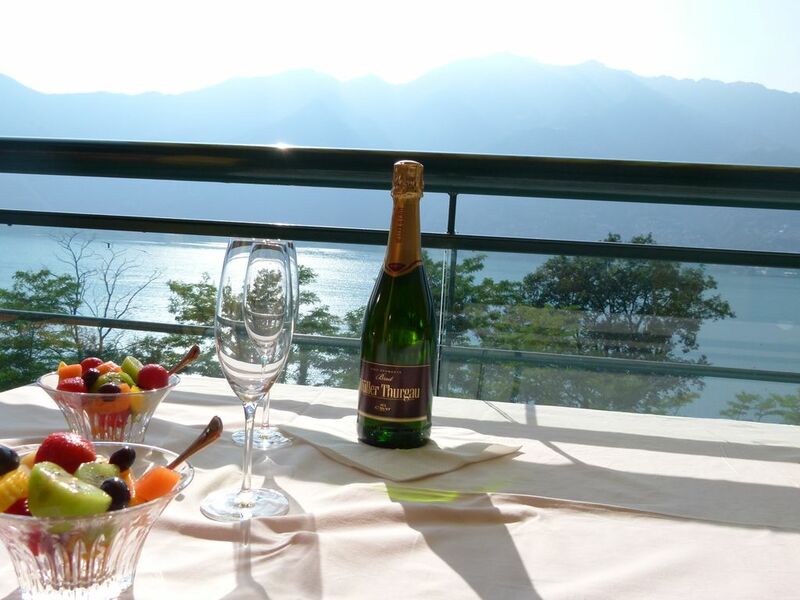 Die große Terrasse und die großen Panoramafenster, Sie können Sie die genießen fantastische Aussicht auf den See, den Brissago-Inseln und die Berge umliegenden. Vielen Sehenswürdigkeiten ships kurzer Zeit: Islands (Borromäischen Inseln am Lago Maggiore) Märkte (Luino, Cannobbio), high Dörfer (Indemini Mulinera und-Tal), andere Stadt: (25 Min.) Luino (15 min. ), Bellinzona, Lugano (30 min. ), Locarno - Ascona (25 min.). Die Wohnung von 65 Square Meters. Es besteht aus einem großen Wohnzimmer mit einer gut ausgestatteten Küche, einem Schlafzimmer mit Doppelbett, ein Badezimmer mit Wanne / Dusche, eine mit Wäscherei Umkleidekabine, eine von Dachterrasse 20 sqm ausgestattet. Private überdachte Parkplätze. Gemeinsamen Garten. Es bietet Platz für bis zu 5 Personen. Production Design: Wohnzimmer mit einem Schlafsofa, Sat-TV (Astra + Eutelsat), Stereoanlage, DVD-Player, Pelletofen. Die Küche ist in den Wohnbereich und ist komplett mit Geschirr und allen notwendigen Geräten (z. Kühlschrank, Gefrierschrank, dishwasher, Induktionsherd, elektrischer Ventilator Backofen, Mikrowelle, Kaffeemaschine, Wasserkocher ...). Doppelbett, Radiowecker, 5. Einzelbett. Heizung mit Pelletofen, air conditioning, Internet-Zugang. Haartrockner, Staubsauger, washing machine and Reinigungsmittel, Trockenraum, Bügeleisen und Bügelbrett. Freizeitführer, Karten, Bücher und Spiele für Kinder und Erwachsene, Videothek. Während des Winters wird die Wohnung von einem modernen Pelletofen beheizt, der ein Minimum an täglicher Reinigung benötigt, aber eine warme und entspannte Atmosphäre mit der sichtbaren Flamme in der Mitte des Wohnzimmers bietet, wo Sie sich entspannen, einen Tee trinken und ein Buch lesen können . Außenbereich: 20 Quadratmeter überdachte Terrasse (mit Gartenmöbeln), private überdachte Parkplätze (neben der Eingangstür), eine große überdachte Raum der "Abstellraum als für Sportgeräte, Garten verwendet werden kann. Die Preise beinhalten die Kosten für die Reinigung, Strom, Gas, Wasser und WiFi. Nicht enthalten sind die Kosten für die Klimaanlage, Bettwäsche. Erforderliche Kaution von € 150.00, für eventuelle Schäden. Surplombant le lac Majeur entouré et par la nature, l'appartement est situé dans une petite résidence dessus Tronzano Lago Maggiore, à 100 m. du lac, dans un quartier très calme, à seulement 2 Km. de la frontière Franco-suisse. The big terrasse et les grandes fenêtres panoramiques, vous permettent de profiter de la vue sur le lac beautiful, les Iles de Brissago et les montagnes environnantes. D'intérêt dans de nombreux sites a court laps de temps: les Iles (Iles Borromees sur le lac Majeur) __gVirt_NP_NNS_NNPS <__ marchés (Luino, Cannobbio), of anciens villages (Indemini et Mulinera Valley), autre ville: (25 min .) Luino (15 min. ), Bellinzona, Lugano (30 min. ), Locarno - Ascona (25 min.). The appartement de 65 mètres carrés. The se compose d'un grand salon avec une cuisine bien équipée, une chambre double, une salle de bains avec baignoire / douche, a dressing équipé d'une laverie, a toit-terrasse de 20 m². Privé parking couvert. Jardin commun. The peut accueillir jusqu'à 5 personnes. Equipement: salle de séjour avec un canapé-lit, la télévision par satellite (Astra + Eutelsat), chaîne stéréo, lecteur DVD, poêle à granulés. La cuisine est dans le salon et est complète avec tous les appareils et vaisselle necessaires (par ex. Refrigerating, freezers, washing vaisselle, cuisinière à induction, four électrique du ventilateur, micro-ondes, coffee machine, bouilloire ...). Lit double, radio-réveil, 5e lit simple. Chauffage avec poêle à granulés, climatisation, accès internet. Hair-dryer, vacuum cleaner, washing machine et a detergent, salle de séchage, fer et planche à repasser. Les activités locales de guidage, des cartes locales, des livres et des jeux pour adresses et enfants, vidéothèque. En hiver, l'appartement est chauffé par a poêle à pellets modern here ne'cessite a minimum de nettoyage quotidien, maize women une atmosphère chaleureuse et relaxante avec flamme visible au milieu du salon où vous pourrez vous détendre, siroter a tea and lire a livre . Espace extérieur: 20 mètres carrés de terrasse couverte (équipé avec des meubles de jardin), parking privé couvert (à côté de la porte d'entrée), a grand espace couvert qui peut 'être utilisé comme stockage pour les équipements sportifs, jardin. Les prix comprennent les frais de nettoyage, électricité, gaz, eau et WiFi. Ne sont pas inclus les coûts de climatisation, et machine. Caution de € 150,00 pour tout dommage. Pas d'animaux en raison d'allergies. Die Wohnung ist sehr sauber und zweckmäßig eingerichtet. Mobiliar und Ausstattung sind modern und ansprechend. Hervorzuheben sind neben dem grandiosen Ausblick die absolute Ruhe und der nette Kontakt zum Vermieter..
Wir verbringen gerade eine sehr schöne Zeit am Lago und kommen bestimmt wieder. EIn herzliches Dankeschön und ebensolche Grüße an Alex! Sehr schönes und gut ausgestattetes Apartment, sehr ruhig gelegen. Toller Blick auf den See und die Berge. Beautiful , clean and well equipped apartment with stunning views . Was met by Oriana the owner who was lovely and extremely helpful. Would definitely reccomend this apartment. We thank you for your review and hope to have you as our guest for your next holiday, we wish you well. Casa ben arredata e con ottima vista sul lago maggiore. Ha tutto quel che puó servire. Ottimo arredamento e cucina. Unica pecca, è fuori dal centro abitato in un complesso di un pó isolato. I nostri migliori auguri di buona continuazione. Il nostro soggiorno è stato molto piacevole sia per la magnifica vista sul lago sia per il comfort degli arredi sia per la pulizia, l'ordine e la completezza dotazioni. Abbiamo apprezzato la gentilezza e la cordialità della proprietaria, sig.ra Oriana. Le condizioni meteo di questa strana estate, purtroppo, non sono state favorevoli nei nostri confronti e non ci hanno consentito di godere appieno della nostra brevissima vacanza. Vi ringraziamo per la vostra recensione e, nell'augurarci di riavervi presto come nostri ospiti per la vostra prossima vacanza, vi auguriamo Buon Cammino. Beach: The beach, in the sand and in the grass, is located next to the surf school (sailing club), bar and panoramic restaurant. Available on request beach chairs and umbrellas. 2 minutes. Old town: Tronzano, Cannobbio, Porto Valtravaglia. Church: Tronzano and pine on the shore of Lake Maggiore (with spectacular views of the lake). Panorama: At least three are the paths that pass through Tronzano, and that lead to Monti di Bassano, the mountain Borgna and Lake Delio, offering panoramic views of Lake Maggiore and Monte Rosa. Other activities: rock climbing and kite. Strategic location: excellent starting point for walking in the car, on foot, by bike or mountain bike, or boat, to quickly reach places and fascinating corners. Beach: The beach, sand and grass, is located next to the surf school (Sailing Club), bar and panoramic restaurant. Available on request sun loungers and parasols. 2 minutes. Panorama: At least three are the Paths That pass through Tronzano, and That lead to the Mountains of Bassano, Borgna the mountain and Lake Delio, Which offer a panoramic view of Lake Maggiore and mountain Pink. Strategic location: very good starting point for walking in the car, on foot, by bike or mountain bike, or boat, to quickly reach places and fascinating corners. ----- I prezzi includono le spese di pulizia finale, elettricità, gas, acqua, pellet e Internet WiFI. Non inclusi sono i costi di aria condizionata e biancheria (letto, bagno, cucina). Richiesta cauzione di € 150,00, per eventuali danni.Non si accettano animali per motivi di allergie. Extras su richiesta: Biancheria da letto e da bagno all'arrivo: € 30,00 a persona; Aria condizionata: € 4,50 al giorno. ​Per soggiorni inferiori alla settimana, le spese di pulizia sono escluse: soggiorno minimo 3 notti. ----- The prices include the final cleaning, electricity, gas, water, pellets and WiFi Internet. Not included are the air-conditioning costs and linen (bed, bath, kitchen). Required deposit of € 150,00, for any damage. Pets not accepted for reasons of allergies. Extras on request: Bed linen and towels on arrival: € 30,00 per person; Air conditioning: € 4,50 per day. For stays less than a week, cleaning costs are excluded: minimum stay 3 nights. ----- ​Die Preise beinhalten die Endreinigung, Strom, Gas, Wasser, Pellets und WiFi Internet. Nicht enthalten sind die Kosten für die Klimatisierung und Bettwäsche (Bett, Bad, Küche). Erforderliche Kaution in Höhe von 150,00 €, für eventuelle Schäden. Haustiere nicht aus Gründen der Allergien akzeptiert.Extras auf Anfrage: Bettwäsche und Handtücher bei Ankunft: € 30,00 pro Person; Klimaanlage : € 4,50 pro Tag. Bei einem Aufenthalt von weniger als einer Woche, sind Reinigungskosten ausgeschlossen: Mindestaufenthalt 3 Nächte. ----- Les prix comprennent le nettoyage final, l'électricité, le gaz, l'eau, des pastilles et Internet WiFi.Non inclus sont les coûts de climatisation et de linge (lit, bain, cuisine). Dépôt requis de € 150,00, pour tout dommage. Animaux non acceptés pour des raisons d'allergies. Extras sur demande: Les draps et les serviettes à l'arrivée: 30,00 € par personne; Air conditionné € 4,50 par jour. Pour les séjours de moins d'une semaine, les coûts de nettoyage sont exclus: séjour minimum de 3 nuits.